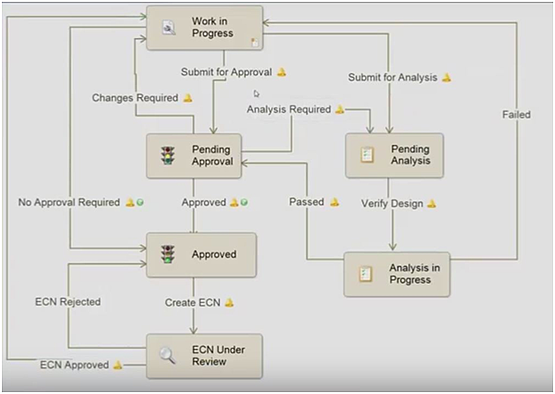 One of the most beneficial and commonly used automated processes of SOLIDWORKS PDM workflows is the ability to send notifications to the right people throughout the different stages of product development. These notifications act like your own personal assistant, sending out emails notifying your co-workers that something is waiting for their approval. These messages contain important information about the files, current stage of the process and a link to the file for viewing. Making it quick and easy for your team to proceed through each stage of a project with ease. Above is an example of one way a company could set up PDM notification workflows. Much like when a part moves from one machine to the next, a design often gets shuffled from person to person with different areas of expertise. Here are three examples of how PDM workflows can help streamline the day-to-day communication between all parties involved in a project. Saving you both time and money in the process. Example #1: Designer creates a revised drawing and saves it to the vault (a storage location within SOLIDWORKS PDM) then submits for approval. Drawing gets watermarked (pending) and emailed to supervisor for approval. It may also trigger a task such as Design Checker to check the drawing against its standard. Designer creating a watermark on the drawing, creating an email specifying the design change and checking the drawing for completed notations. Example#2: Supervisor gets email and checks out the drawing. The drawing looks good so the drawing is approved. Revision gets added to the title block and PDF gets emailed to the right people or placed in the proper location while sending an email notification. Asking designer to adjust drawing info for new revision and locating the right people to send new revision to. Example #3: Designer/Supervisor initiates an ECN. Files get routed to the proper people for approval. People are notified via email and tasks such as file converter (which converts a file to a neutral format) can be executed. Notifying supervisors individually, sending files to the necessary locations and converting the file to a neutral format. Thanks for reading! Check out our PDM Video & Resource Library for other related content. Editor's Note: This post was originally published in October 2015 and has been updated for accuracy and comprehensiveness. The Alignex Team of application engineers combined their depth of experience and industry knowledge to bring you the contents of this article.